The sunny weather we’ve enjoyed this week is now gone, as high pressure has been firmly supplanted by an onshore flow. We’ll see a steady diet of cloud cover through Saturday, with moisture moving onshore that will culminate in the potential for heavy rain on Friday night and Saturday morning. To mark this threat, the National Weather Service has issued a Flash Flood Watch for the region from Friday afternoon through Saturday morning. We discuss this threat below. After a start in the 50s, highs today will climb into the upper 60s under mostly cloudy skies. Southeasterly winds will transport moisture inland throughout the day, and although we can’t rule out a few isolated showers we don’t expect anything significant. Low temperatures Thursday night won’t fall much below the mid-60s for most of the area. The upper-level low pressure system will be moving down through Texas, approaching the Houston region from the north-northwest. We expect some light- to moderate rainfall on Friday in the Houston metro area during the daytime, but for the most part, heavier showers should remain west of Harris County until around sunset or so. Highs Friday should climb to near 70 degrees under mostly cloudy skies. Conditions will probably begin to deteriorate around, or shortly after sunset in the Houston metro area. We expect the region to receive 3 to 6 inches of rainfall between sunset Friday night and mid-morning on Saturday, and we likely will see some higher isolated totals around 8 inches or so. This is going to cause some flooding problems on area roadways, but bayous and streams around the region are low enough that they should be able to absorb the majority of this rainfall. In terms of areas most favorable for rainfall, we can generally say that slightly higher amounts are likely north and west of Highway 59. However, forecast models are pretty consistent in delivering a healthy dose of heavy rain to everyone in the region. If you have plans Friday night around town, I’d either re-consider them, or have a strategy to watch the radar when you’re out. The western half of the city is likely to see the onset of heavy rain by or around midnight, while the eastern half probably won’t see the heavier rains move in until early Saturday morning. 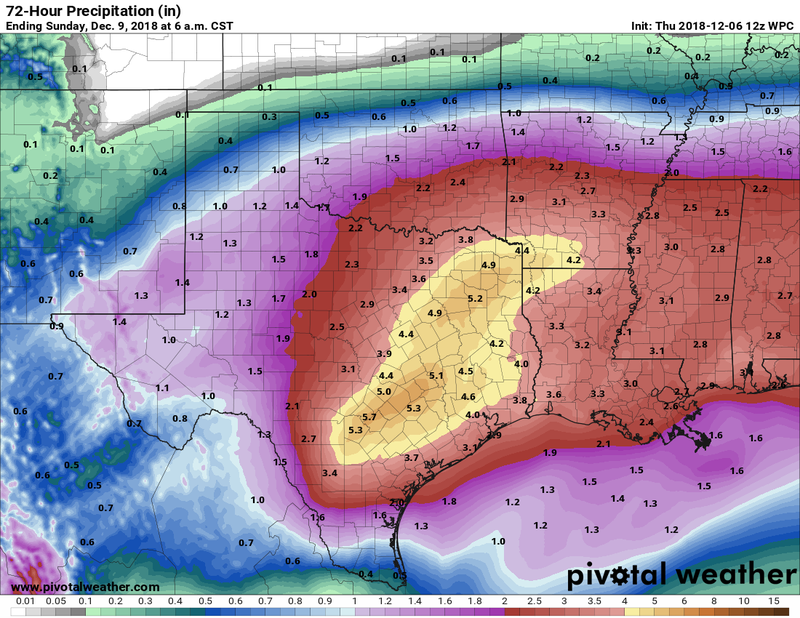 In terms of severe weather, there is the potential for some strong thunderstorms and straight-line winds, but those threats appear to be greater to the southwest of the Houston metro area. Our principal concern remains heavy rainfall. This blob of rainfall should be chased from the area by a line of showers and thunderstorms representing the actual cold front on Saturday morning. 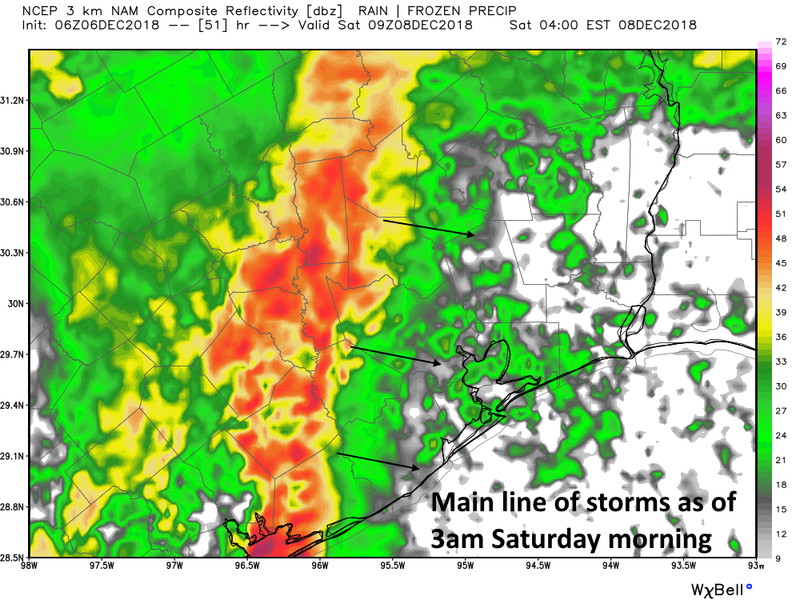 Right now I’d anticipate this front moves through the city just before sunrise on Saturday, give or take a few hours, and we may see some remnant showers linger through the mid-morning hours. However, drier and colder air will move in behind the front, and this should help to end the threat of rain. Temperatures will fall into the 50s by the afternoon, with overnight lows likely in the 40s. These will be cold, dry, and sunny days with highs only in the 50s. Both nights will probably see lows in the upper 30s for inland areas, and 40s for the coast. Hopefully the region won’t have too much drying out to do during these days. 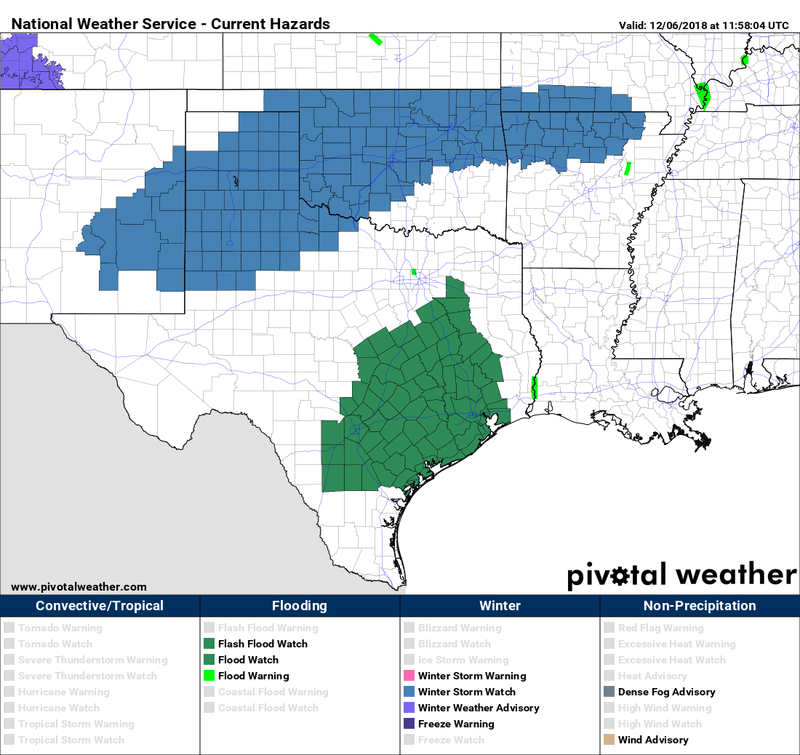 How does this system compare to recent flooding events to you guys? It will be a moderate level event, most likely. Hopefully just a street flooding issue for a few hours. As long as the bayous can contain the excess water, we should be fine. We may have puddling in our yard, but that will be the worst of it, and will drain off Saturday and Sunday if the front moves out as predicted. I have tickets to go see Christmas Carol at the Alley on Friday. Is this event something that should cause me to reconsider going to the theatre? I’m no meteorologist, but I think you should still go because the production is SO good this year! I have a Christmas party inside the loop in Houston and I live in the NE part of town. The party is at 7. Is this something i should reconsider? I’m flying back into Bush airport around 8:45 tomorrow evening. Would you anticipate any weather issues that might cause a delay? I’m at a school in Humble that is supposed to have a fun run tomorrow that wraps up before noon. Do you think it will be ok? Or will rain be hitting by then? I’ve seen consistent messages from city and county leaders that if you have plans Friday night, you should reconsider and stay at home. We plan to drive to Dallas Friday night. Too dangerous? Just use your own judgment. Eric is not here to respond to everyone’s personal situation. At exactly 3:43AM on Saturday Dec 8 I plan to travel to Blackhawks’ front yard and turn on my leaf blower. Will it be raining? I live in Katy… uh, nevermind! It sounds like Saturday will be a fine day to sleep in. Glad my Christmas parties are Saturday evening and not Friday! I love weather but reading these comments makes me somewhat glad I decided not to pursue meteorology as a career. It was nearly a year ago when we got snow. Imagine if this much moisture had been in place, we’d gotten like 50″ of snow. Flooding only happens on holidays in Houston. Warning: Friday is listed as National Cotton Candy Day. Saturday is listed as National Brownie Day. Ah, Friday is Pearl Harbor Day. Mandatory watching of Tora! Tora! Tora! on DVD. At least where I live. Question: my manual sprinkler system is scheduled to run Friday evening. Do I A. Let it run? B. Cancel it? C. Reduce the time that it runs? Depends on how much water you want to waste. I am visiting inlaws in Woodville, east of Livingston this weekend, should we expect a similar arrival time or the weather as given for Houston? Yes, it will be similar in terms of arrival and exit. Hey Eric, thanks for the updates. Do you think these storms pose danger to houses that have flooded in the last 3 major flooding events? Debating if this is an event worth flood-prepping for. Appreciate the advice and help! I do not. That is not a guarantee, but my sense is that if you’re overly anxious about this event, it’s probably not going to be as bad as you think.